Recently, Twitter rolled out a great new feature on their site - lists. You can now create and compile a list of twitter users and make it easier for others to follow all at once. Also, at the same time, they expanded their API to include list management functionality. This allows us to use these new tools to create a widget that flips lists the other way around - a fan page you can put in your sidebar, that allows your visitors to fill in their twitter name and join a specially crafted fan list in your twitter account. Important: Twitter recently made a radical change to their authentication API's, which makes it impossible for this example to work. However, one of our readers has been kind enough to rework it with the new APIs. Read more in our comment section on how to download and implement it. Note: This tutorial is quite old and doesn't work with twitter's new API. We are keeping it online only as a reference. As usual, we start with the XHTML. As the widget is entirely AJAX based, this is the only code that you will need to include directly into your site. The rest is fetched asynchronously. Here we have the main fanPage container DIV, which holds our the widget and inside it we have the title, content and subscribe DIVs. These are later styled with CSS and populated with data via AJAX. Also notice that we have three links which share a FanPageLink class. Currently they point to the twitter's main site, but later we are going to edit their href attributes dynamically, and point them to the member page of the list. Once we have the markup in place, we can move to the CSS. Here are only presented the rules that are directly used by the widget. You can view all of the code in demo.css in the source archive. Nothing ground-braking here. Notice how we've set up CSS rounded corner rules to three types of elements at once (line 127). This way we make it easier to edit the roundness of the widget easier (it would be even better if all the browsers supported border-radius directly, and didn't need vendor-specific code). Also you can see a demonstration of the technique I used to make the hover buttons below. As I mentioned earlier, the entire widget is AJAX based. This is actually a necessity, because communication with the twitter API would stall the website otherwise. Later if a click occurs on the green "Join" button, the avatars are faded out and a form appears on their place. The sendData function is called if the user clicks on the newly created gray "Join" button below the input field. It also checks the return status of the AJAX request to choose the proper status message. Now that we followed all the code on the front-end, it is now time for the last part of this tutorial - the PHP back-end. PHP has the important task of communicating with the twitter API. This is done via a special extension - CURL. For convenience, I made a special function - curlMe that wraps the CURL code and makes it easier to send requests from other places in the script. Now that we've defined those functions, we can use them in any PHP file by just including or requiring functions.php in the script. As with any API, there are limits of usage. This is done to prevent abuse of the service and ruining everybody's day. Twitter enforces a 150 requests per hour rule, which limits how many times we can GET data for the twitter list. This is why I build a simple caching mechanism, that stores the fetched data for 15 minutes after a request is made to the API. Also you might notice that the API requires you to provide you username and password in order to use it. So if you are planning to run the demo on your own server, be sure to fill in your log-in information in config.php. With this our Twitter List Powered Fan Page is complete! 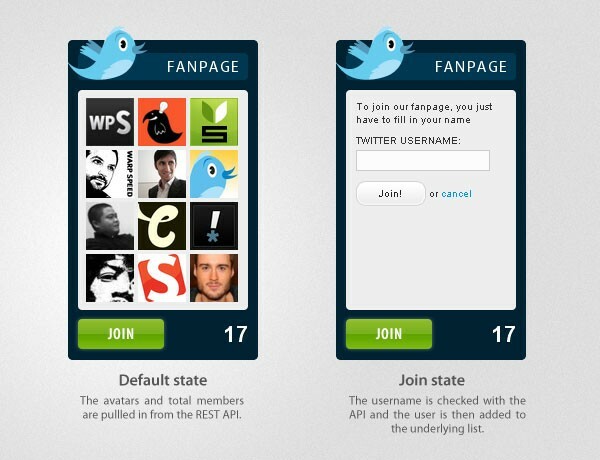 Today we learned how to use the newly-released twitter lists and the REST API to create a community driven fan page. As you may remember, this is actually not the first twitter widget we've made. If you just want to showcase your latest tweets in your blog, you can use the jQuery Twitter Ticker we made a few weeks back. Also if you've customized this tutorial and used it in a site, it would be great to share what you've done with the community via our Tutorial Mashups feature, above the comment section. That's excellent, I could use this for a myriad of projects. Cool, I like the panel with very clean design. A great idea, Nick. This would surely benefit a lot of people. Thanks for posting this, I think it's a great idea. Also Nick a wordpress plugin is just what I was looking for. Some good stuff here! I always love to see new ways to integrate twitter. I think it is more attractive and effective than just the little "join me" bird. Great tut! I just added it to my site http://markandandi.com but realized I can add anybody as a fan after adding APlusK. That's cool though. Unfortunately it is not possible to ensure that the user is who he is claiming to be, without making him fill in his twitter credentials (which is not a good idea and will hit the number of people who actually join). Also congrats on your design, the widget looks nice in the sidebar! Hi, I try this code, But I can't see to manage to get my fans to load. Where did I had to edit the code, only in the config file ? Hi thanks for this. I it easy to show thumbnails in random order? Have a hint on how to do that? I got this to work but the number of fans is stuck on 2, even when I have 10 fans thumbnail listed. Great work.could i use this in word press powered site? The script caches the number of fans for 15 minutes. So you will not be able to see any changes during this time. I'm afraid this solution is not compatible with jQuery v.1.4.2. The source files were updated for jQuery 1.4.2. Nice widget, but I have some problems with it. I'v introduced in config.php my twitter user name, password and also the name of my new list (fans)... I save the file and open in my browser the demo.html ... and nothing! the widget is loading and loading and nothing appear, I can not see my fans... Where could be the problem? Martin please answer to my questions. @ WPSMASH, can you share a link? I can't give you a link because I am working on localhost now. Could be this the problem? It could be. You have to make sure that you can fetch remote pages with CURL under PHP. You can setup a test php script, and include "functions.php" inside it. Then just put a call to the curlMe function and try to fetch a remote page (e.g http://tutorialzine.com/). The function returns the remote page as a string, so printing it on screen should display the remote page. Martin, thanks so much for this. You have saved me a whole bunch of work! I am also very impressed with this, both will be added to my site today. I already have oAuth working on my site for anon or registered users so I will make the change on my site that twitter users will need to be authenticated with twitter in order to join and follow me. For me this is preferable as it represents an accurate following. Nice trick to share with us, thank you! Would love to see this updated with OAuth so I could see it working.